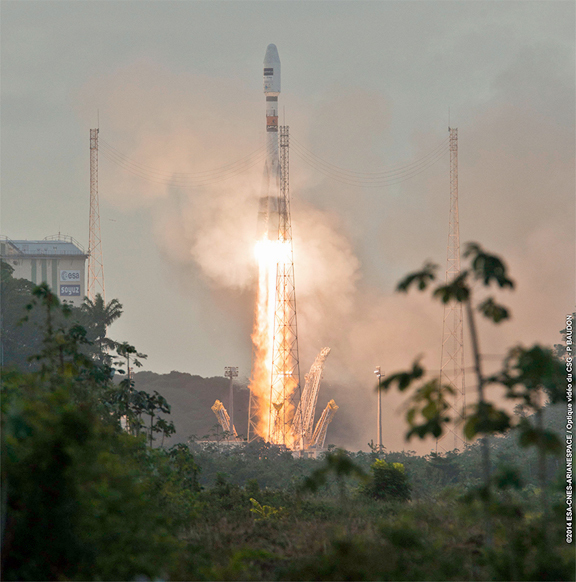 [SatNews] Arianespace has delivered on its primary mission to support Europe with guaranteed and autonomous access to space, successfully orbiting the Sentinel-1A Earth observation satellite on a medium-lift Soyuz flight from the Spaceport in French Guiana. The medium lift Soyuz awaiting the launch command in Korou with the Sentinel-1 satellite payload aboard. Sentinel-1A is the milestone first spacecraft to be orbited for Copernicus, a program of the European Commission in partnership with the European Space Agency (ESA) that will create a sustainable European satellite network to collect and evaluate environmental data for civil safety and humanitarian purposes. Departing with its Soyuz launcher at the precise liftoff time of 6:02:26 p.m. in French Guiana, Sentinel-1A was deployed into a Sun-synchronous orbit—from which the satellite will deliver essential data for Copernicu—during a flight lasting 23 minutes. Sentinel-1A was developed in an industrial consortium led by Thales Alenia Space as prime contractor, with Airbus Defence and Space responsible for the C-SAR synthetic aperture radar payload. Its environmental tasks will include maritime surveillance and monitoring of sea ice, oil spills, landslides and floods, with data collected to assist in reconnaissance and operational support activities in response to natural disasters. Copernicus is one of two flagship space programs managed by the European Commission, along with the Galileo global navigation satellite system. Galileo was developed to provide Europe with a high-precision and independent positioning system – with the first four spacecraft deployed on two separate Arianespace Soyuz missions in 2011 and 2012. Soyuz initiates its climb-out from the Spaceport’s ZLS launch site on Arianespace’s successful Flight VS07 mission with Sentinel-1A. Total payload lift performance for today’s Sentinal-1A mission – designated VS07 in Arianespace’s family numbering system – was more than 2,270 kg. 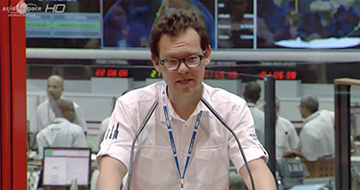 In comments from the mission control center after today’s Soyuz success, Chairman & CEO Stéphane Israël said Arianespace has always been committed to the endeavor of “bringing space down to Earth,” and reiterated the company’s readiness to support further missions for the benefit of all European citizens with its full launch vehicle family – composed of the medium-lift Soyuz, heavyweight Ariane 5, and light-lift Vega. He added that Arianespace’s successes with the initial Galileo and Copernicus spacecraft have paved the way for many more in the two-to-three years to come, as the company’s order book includes 14 Galileo satellites still to be launched on Ariane 5 or Soyuz missions, along with two additional Sentinel satellites that will be orbited by Vega. “Let me thank Arianespace – the most reliable operator worldwide – which showed today that it could continue its series of successes with Soyuz, Ariane 5 and Vega,” said Jean-Jacques Dordain, Director General of the European Space Agency. Sentinel-1A is the 41st payload lofted by Arianespace for ESA, and its launch today foreshadows additional European institutional missions in 2014 that will utilize the company’s full launch vehicle family – including an Ariane 5 flight with the fifth and final Automated Transfer Vehicle for servicing of the International Space Station; launch of the first Galileo FOC (full operational capability) satellites by Soyuz; and a Vega flight with the IXV experimental re-entry vehicle. Chairman & CEO Stéphane Israël announced that after today’s Soyuz success, the next Arianespace mission is Vega Flight VV03 with the DZZ-HR satellite, scheduled for April 28. As a further endorsement of this growing track record, Israël announced a new agreement with Russian space agency Roscosmos for the supply of seven more Soyuz launchers and associated services – which, when added to the nine vehicles from the previous batch, will cover Arianespace’s medium-lift needs until 2019. Flight VS07 was Arianespace’s third mission conducted from French Guiana so far this year – following an Ariane 5 launch on March 22 and another on February 6, which orbited a combined total of four telecommunications satellites. Up next in Arianespace’s 2014 schedule is Vega Flight VV03 with the DZZ-HR payload. This Earth observation satellite was built by Airbus Defence and Space for the Republic of Kazakhstan, and is scheduled for liftoff on April 28. The European Space Agency's Sentinel-1A satellite, designed and built by Thales Alenia Space, was successfully launched from the Guiana Space Center in French Guiana, using a Soyuz-Fregat A launcher. Sentinel-1A is the first satellite in Europe's vast Earth Observation program Copernicus (formerly known as GMES), coordinated by the European Commission, with the European Space Agency (ESA) in charge of the space component. It is designed to give Europe complete independence in the acquisition and management of environmental data concerning our planet, to support Europe's public policies. Thales Alenia Space was named prime contractor for the Sentinel-1 and Sentinel-3 missions, with responsibility for the design, development, integration and testing of the satellites comprising these systems. “The success of this first Copernicus launch is particularly important for Thales Alenia Space," said Elisio Prette, President and CEO of Thales Alenia Space Italy, "since it further confirms our company’s recognized expertise in the construction of Earth observation satellites based on radar technology. Thales Alenia Space has once again shown that it has the skills and expertise to meet the technological challenges of this program, underscoring our company’s pivotal role and our perfect fit with Europe's strategic vision for space."